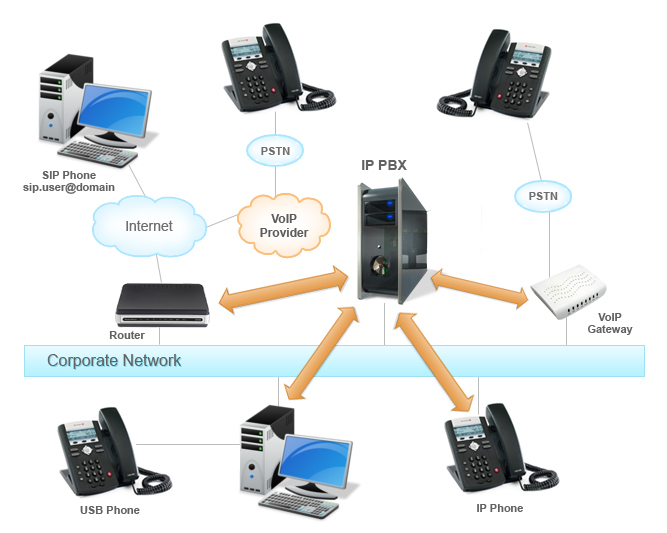 IP PBX Benefits - Toronto, Markham, Richmond Hill | SunTel Technologies inc. The IP PBX is an entire telephone system that provides phone calls through an Internet Protocol data network. Every conversation is sent as a data packet through the network. This system has advanced communicating features and provides a worry free scalability and richness that every owner wants. IP PBX’s are able to adhere to the traditional PSTN lines through a gateway- s now upgrading business communications to this system with the most advanced data network is simple. Businesses do not have to interfere with their external communication operations with the IP PBX system. When the IP PBX is turned on, businesses can keep their original phone numbers. The IP PBX converts any local call over to the network inside the business and permits every user to be able to share the same external lines. The IPPBX phone system has one or more SIP telephones, a server and an optional voice over Internet Protocol Gateway to connect the existing PSTN lines. The server functions similarly to proxy servers. SIP users who use SIP phones or analog phones are able to register with the server, and when a user makes a telephone call they have the IP PBX to do it for them. This server has a list of all the phones and users with their SIP address and then is able to connect internal calls to external calls by a gateway or the voice over Internet Protocol service provider. More information can be found in the FAQ article. The IP PBX is used as software on computers which is able to leverage the computer power as well as all of Window’s benefits. Anyone who knows how to network as well as knowledgeable in computers is able to install this system. A stand alone phone system usually requires a trained person to install their own system. The IP PBX system is able to be managed through the web configured interface, as well as a GUI. This allows the user to easily maintain their phone system. Stand alone phone systems usually have difficult interfaces that are usually managed my technicians. An IP PBX is easily adaptable for using a voice over Internet Protocol provider when calling long distance or internationally. The cost savings are significant for the user. If a business has different branches, one can call the system in between branches and have free telephone calls. The internet protocol system allows the user to connect analog phones to a computer port (and then share it with the next computer). SIP phones can be installed onto the computer. Business’s can now do away with phone wires, and are able to add or move extensions simply. New offices are able to be configured to eliminate ports to be used from the phone system. The open SIP standard is what IP PBX’s are based on. Now a user is able to mix any analog or software telephone with a SIP IP PBX, gateway or provider. A stand alone system requires stand alone phones to use the features of the system and modules to add additional features to the system. Stand alone systems are outgrown every day: Adding additional telephone lines and extensions requires more modules. Sometimes businesses need to purchase a new telephone system. This is not so when a business has an IP PBX: a normal PC is able to handle a lot of telephone lines and extensions. If there is a need to expand, just add more phones to the network. A business is able to use the IP PBX to have better customer service and productivity. The Internet Protocol phone system is based on the computer so now the user is able to integrate functions with business apps. An example would be when the user has to bring up the callers record and the record will be automatically pulled up when the person calls in, which cuts down searching time. Calls placed out of the business can be taken from Outlook, eliminating the user to type in the number. The IP PBX is based on software; it will be easier for people to add features. Many voice over Internet Protocol systems already come set with features, which includes auto attendant, ring groups, voice mail and more. In stand alone phone systems, these features are rather costly. The term hot desking refers to the process of moving offices easily which have become quite popular. Ordinary PBX systems need to have extensions to be patched to new office locations if someone moves. The employee only needs to move their phone when using an IP PBX system. No patching is required for moving phones. If an employee wants to roam, this is for users to be able to work at home. The employee can use the SIP phone and take calls from their extension, as like they do in the office. Calls are also able to be diverted due the SIPs characteristics. Many employees do not use advanced features because they are too difficult to use. Some features are setting up conference calls or transferring a call to someone else. Old PBX systems require instructions in order to function. With an IP PBX, all the features can be used the Windows GUI, which is user friendly. The user also gets an overview on the statuses of other employee’s extensions, as well as incoming calls and calls in queue. Stand alone phone systems usually need an expensive phone to do half of the features as an IP PBX system can do. Many older systems are cryptic to the user. Purchasing an IP PBX software system is good for new companies as well as existing companies who already own a PBX. The IP PBX provides the user with significant cost savings when managing the system, as well as in maintenance and ongoing costs that this choice is the best choice for every company.